Chinese New Year 2019 is but one week away! Have you completed all your CNY shopping and other CNY errands? 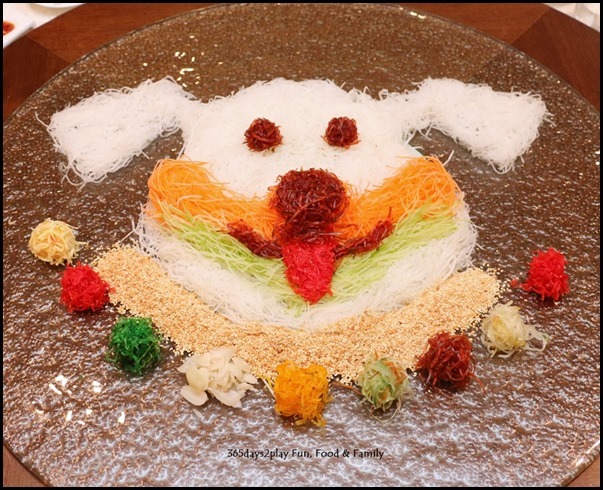 One Chinese New Year tradition that must not be missed is the tossing of yusheng with family, friends and colleagues, aka lohei! The Chinese believe this is a very auspicious way to welcome the new year. Even if you are not a believer, it cannot be denied that this is a very fun activity to participate in, be you young or old. The aim is to toss it high while still keeping it within the platter! 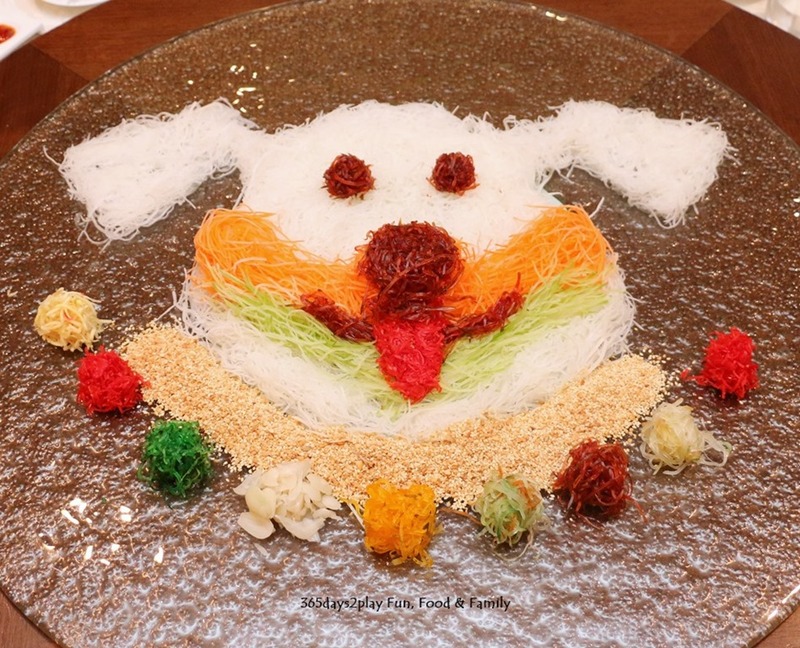 Check out my video at the end of this post to see how toddler Edward reacted to his first lohei! Priceless! 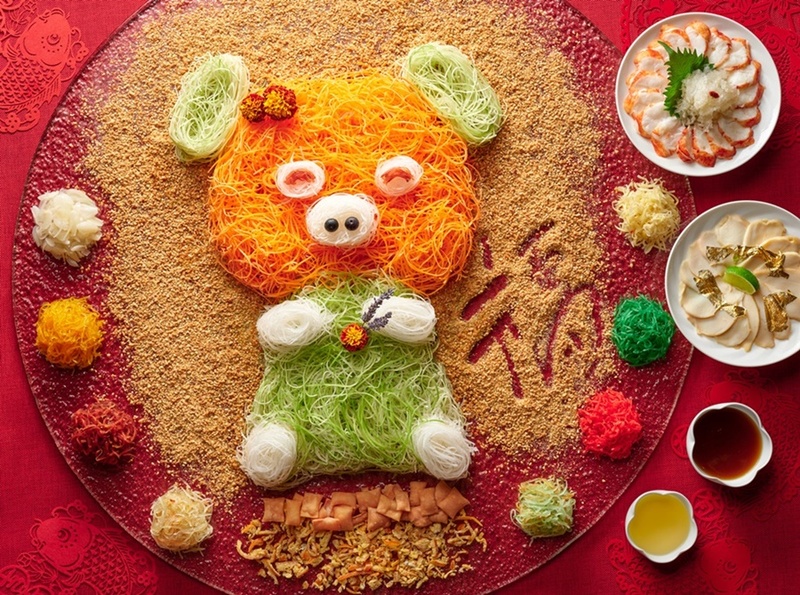 Anyway, here are 8 places where you can get yusheng in Singapore. Bonus one at the back too! Huat Ah!!! 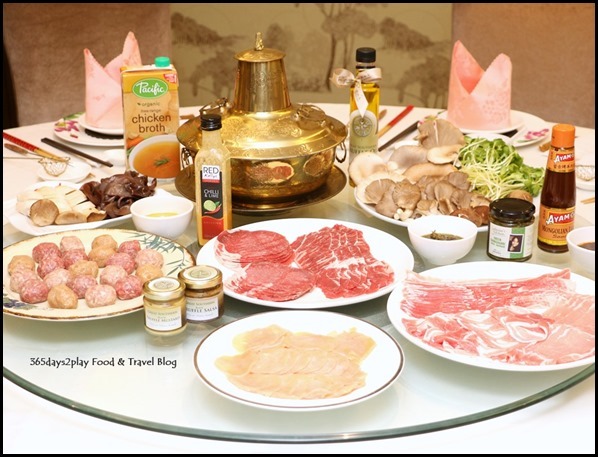 The Chinese New Year 2018 media tastings are coming in fast and furious, and it’s not a minute too early because have you heard, some popular restaurants are already fully booked or close to being fully booked. Some hotels have even resorted to opening up their ballrooms to cater for more reunion dinner tables, although those are likely to be buffet style because getting manpower on Chinese New Year Eve is going to be craaaazy! Here are some more pictures from the CNY preview of Swissotel Merchant Court’s Ellenborough Market. 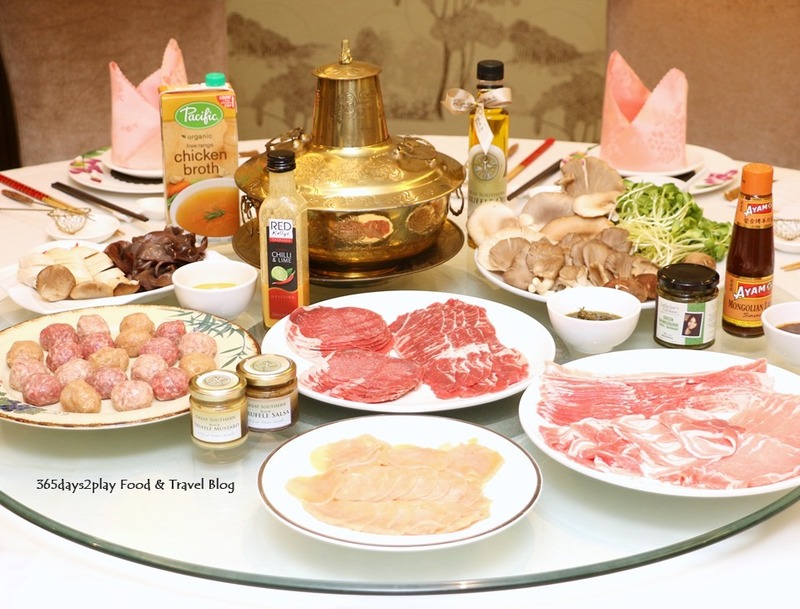 They will be offering both buffet as well as set menus for Chinese New Year. Prices at the end of this post. Available from 22 January to 2 March 2018, Hai Tien Lo will be offering a grand total of eight reunion set menus featuring everyone’s favourite CNY delicacies. There will also be one nutritious vegetarian set menu. 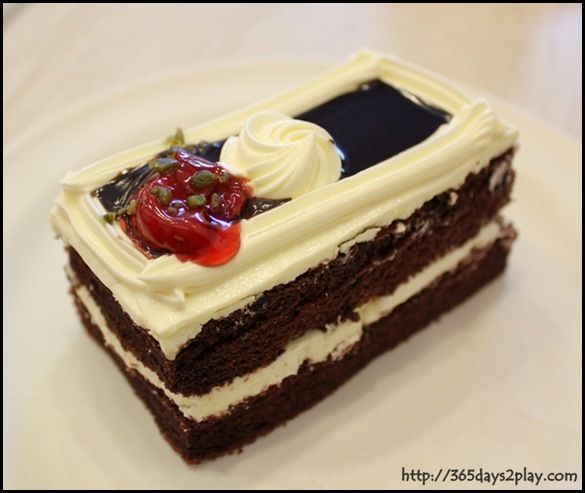 Scroll down to see pictures of a selection of dishes from the set menus. 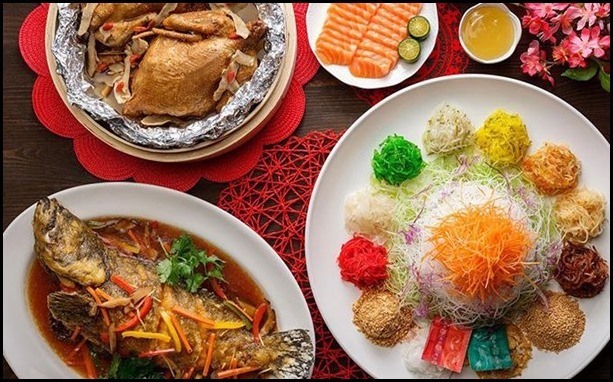 Chinese New Year is but two weeks away, have you already made plans for your reunion dinner? I know many of you out there will be celebrating in the comfort of your homes by having steamboat gathering. Where do you usually buy your ingredients for steamboat? NTUC, Cold Storage or the wet-market? Well you can also consider buying your steamboat meats from Ryan’s Grocery. Ryan’s Grocery is a specialty gluten-free grocer and organic butchery, and for CNY, they’ll be retailing free-range shabu-shabu sets, organic meats and wild caught seafood. I won’t go into the benefits of eating organic food, and I know that there will always be people who will not want to fork out the extra cash for organic food, but for those of you who are keen to go organic, if not all the time then at least once in a while, you might want to check out Ryan’s Grocery. The prices are not that high actually, for organic products. My family likes to gather over tea and toast every single day and Chinese New Year is no exception. 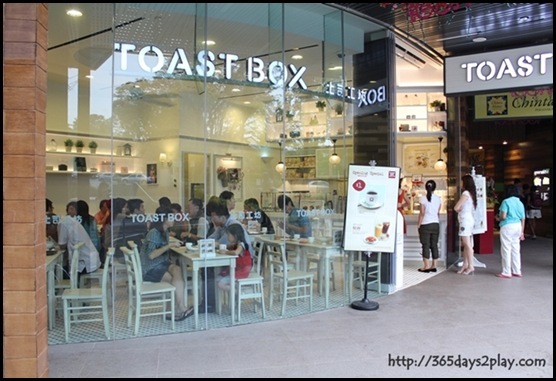 After escaping from the 1st house we visited slightly earlier than expected, we spent the spare time chilling out at ToastBox. I’d read about this quaint little retail mall called Greenwich V, located in the Seletar Hills area and I knew I just had to visit. Even though I’d prepared this list on what shops are open during CNY, I didn’t check up on Greenwich V. We kinda took a gamble and were relieved to see the bright lights of ToastBox greeting us at the entrance of Greenwich V. BTW, Greenwich V is so small, there are only 2 floors. Cold Storage takes up half the space on the 1st floor. The 2nd floor is already the roof garden, but there are a number of eateries up there such as Coffee Bean, Cedele and Paradise Inn. There are also non eateries like Jan & Ellie English Language School, Home-fix the DIY Store and the Phoenix Medical Group. It kind of reminds me of myVillage, but even smaller! We got free parking today thanks to some guy who’d knocked down the gantry. 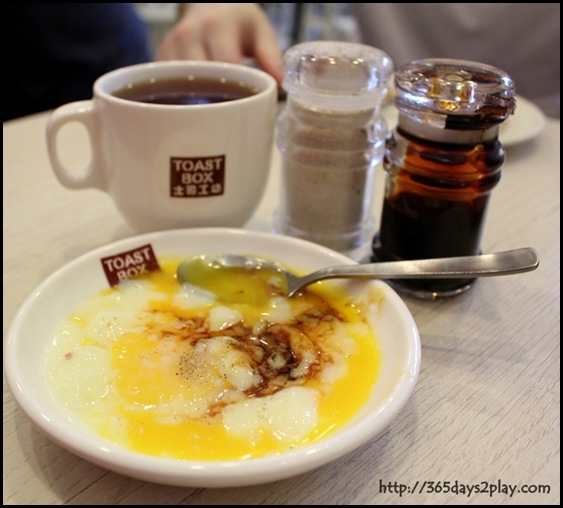 Today, we indulged a little and ordered the little traditional tea cakes from Toast Box. They always look so dainty and mouth-watering in the display cases, but I try not to eat them since the tea is already quite fattening too. But it’s Chinese New Year, so it’s okay for today. Besides, refer to quotation above. Chocolate and cherry cake, quite good actually. I like the chocolate sponge but I removed most of the cream as there was too much of it. 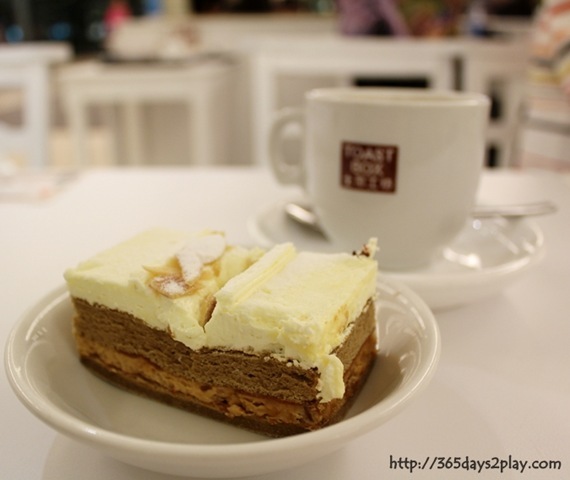 I like it that it’s mostly sponge, cuz I prefer a cake with a higher ratio of sponge to cream/mousse. For just over a dollar, I’d say it is really value for money. And the thing is, sometimes you just want to have a few bites of cake. Why pay $6 for a huge slice when $1.20 will suffice? 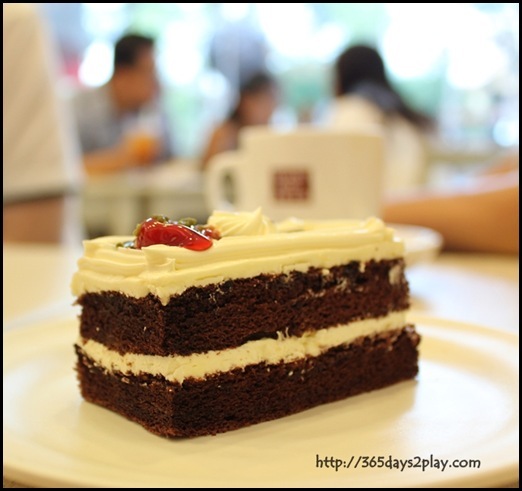 Like that you can have cake everyday, or twice a day in fact. Seriously, where can you find cake for $1.20 in Singapore??? 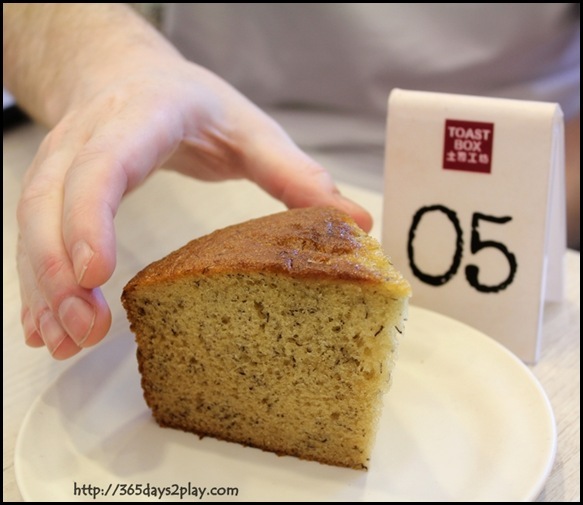 The Banana Cake in my opinion is pretty bad. There is hardly any taste of banana at all. The cake is on the hard side too. My banana cake is loads better. 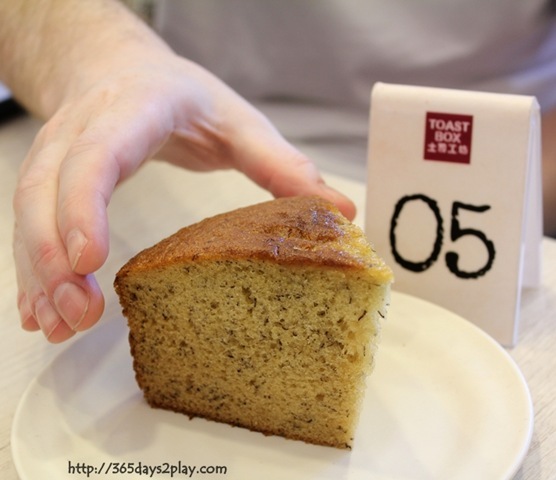 The Partner thinks that for $1.50, the banana cake is okay, and since he doesn’t fancy any of the other cakes, he has no choice but to order banana cake at ToastBox. So I can tell you that this banana cake is consistently bad. 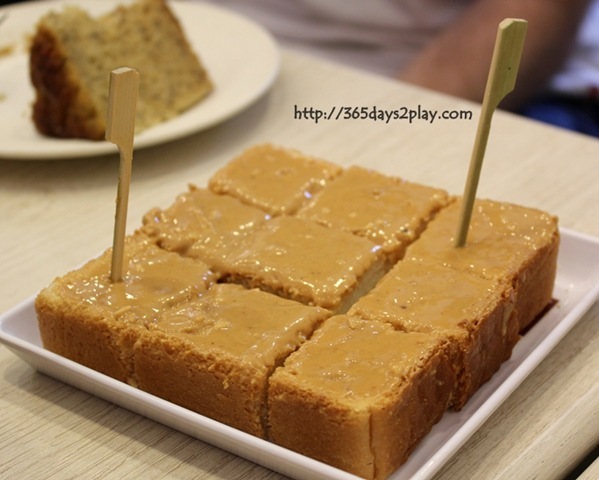 My father had this Peanut Butter thick toast. One good thing about ToastBox is that they always slather on lots of peanut butter or whatever topping you choose, onto their thick toast. 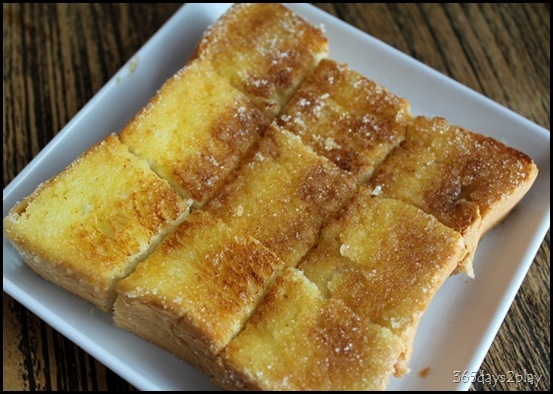 My ultimate favourite thick toast topping is just plain old butter and sugar. It’s the BEST! And the middle piece is the best of the lot because there’s no crust to deal with! The Toast Box branch at Greenwich V.
Well so that was afternoon tea break. 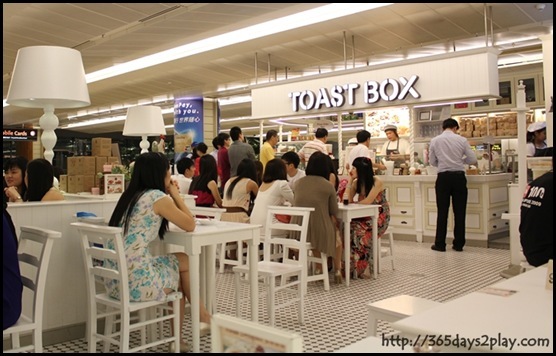 In the evenings, we had another family gathering with my father’s siblings and their family at Changi Airport’s Toast Box. Thanks to my prior research, I knew that Yakun would not be open on CNY so we strategically chose to go to Toast Box at Terminal 2. We got a table for 10 people without any trouble. If you’re afraid of crowds, go to Terminal One or Terminal Two. Cake number 2 for the day. Peanut cream cake. In my opinion, not as nice as the chocolate cake as the peanut flavour is a little weird. 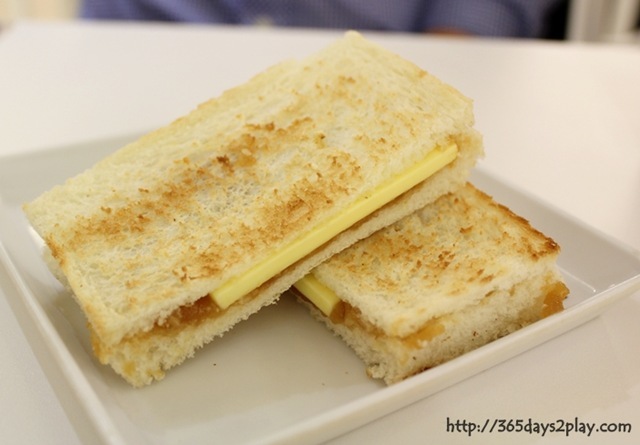 Wanted to order the butter sugar thick toast, but ended up with the butter sugar normal toast. Apparently they do not spread the butter nicely on the toast for you. As you can see, the slice of butter was way too thick for the bread, so I scooped most of it out. For the same price I think I’d rather go for the thick toast. I just realised Toast Box offers Buttermilk Thick Toast. I wonder if that can possibly taste good since buttermilk is sour! Toast Box at Changi Airport Terminal 2. It’s on the same level as McDonalds, just at opposite ends. 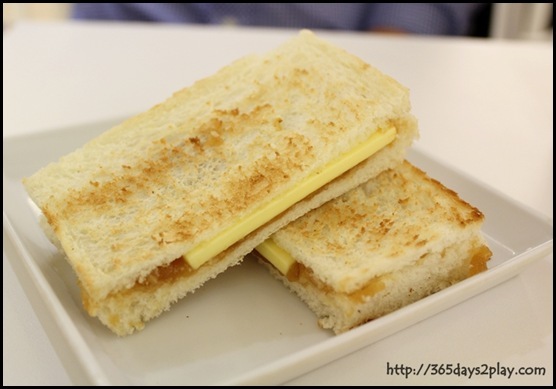 Click here for all my posts on Toast Box.